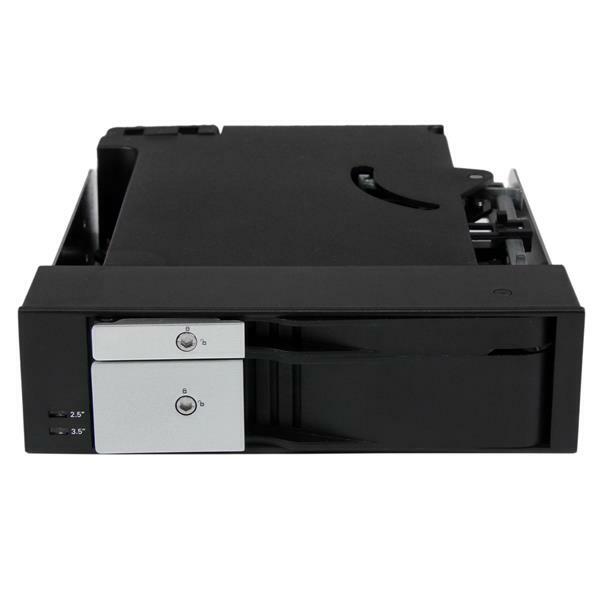 The HSB2535SATBK Removable 2-drive backplane lets you quickly install and hot-swap drives from the front of your computer, by turning a 5.25" bay into a hot-swappable SATA/SAS interface for you to connect a 3.5” SATA hard drive (HDD) and/or a 2.5” SATA hard drive or solid state drive (SSD). 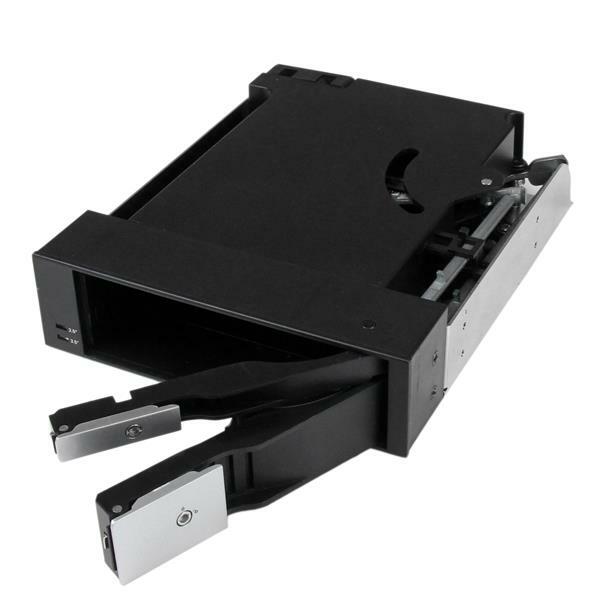 The hard drive bay interfaces with SATA/SAS, offering two trayless hard drive bays and can be mounted into any 5.25" front bay, to provide a hot-swappable mobile rack. The bays feature ejection levers which allow drives to be installed and removed quickly from the computer system, providing a convenient way to create backups that can then be removed for safekeeping, archiving, or external portable access. 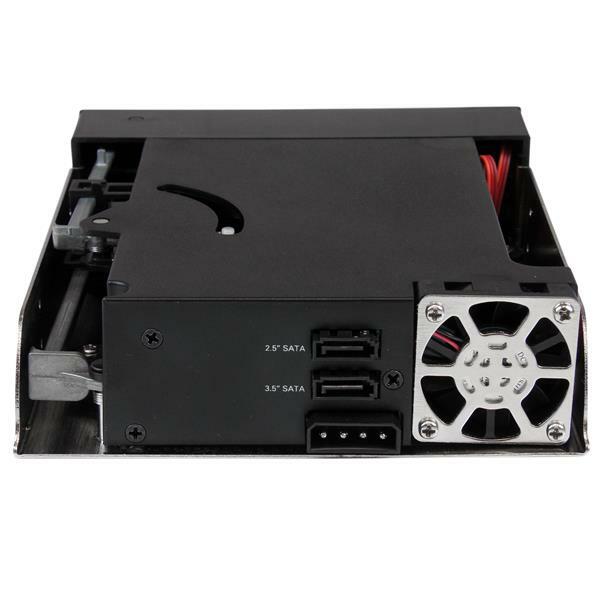 For added versatility the backplane provides support for both SATA and SAS interfaces, an ideal accommodation for enterprise system integration. Plus, to help prevent drive failure, the bay provides excellent heat dissipation with a built-in fan and slotted aluminum enclosure. The HSB2535SATBK is backed by a StarTech.com 2-year warranty and free lifetime technical support. (4 stars) Good way to add additional storage to your system! 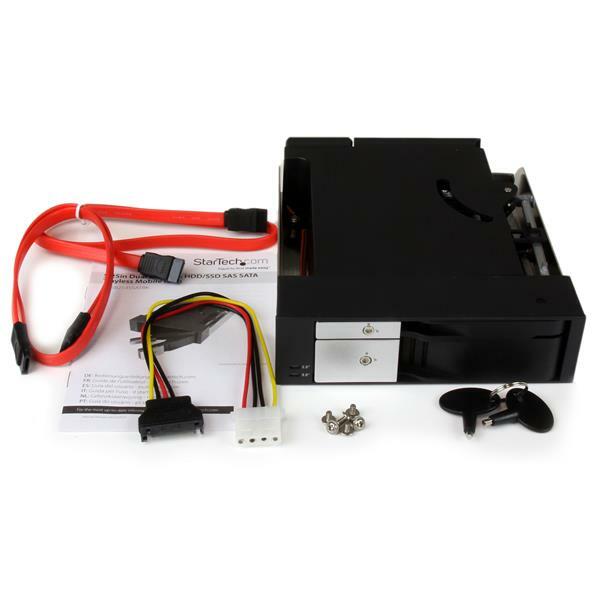 This bay is easy to install into your system and makes swapping drives easy and convenient. While it seems to have solid construction some elements are plastic and feel under designed. It would be nice if the drive lights had more space between them so you can see from a distance which drive is getting use. As for functionality, both drives I attached worked great and I had no issues while testing the hot swap capabalities. Overall this is not my favourite StarTech product but it does work as advertised. I received this product in exchange for an unbiased review. (2 stars) How do you eject the SSD? Bought this last week and I really like the concept. The HDD is just fine, but I cannot eject the SSD. Just opening the door does not do anything and there is no eject button. What am I missing? Thank you for your feedback on HSB2535SATBK. We're sorry for the trouble you've had with ejecting your 2.5" drive. 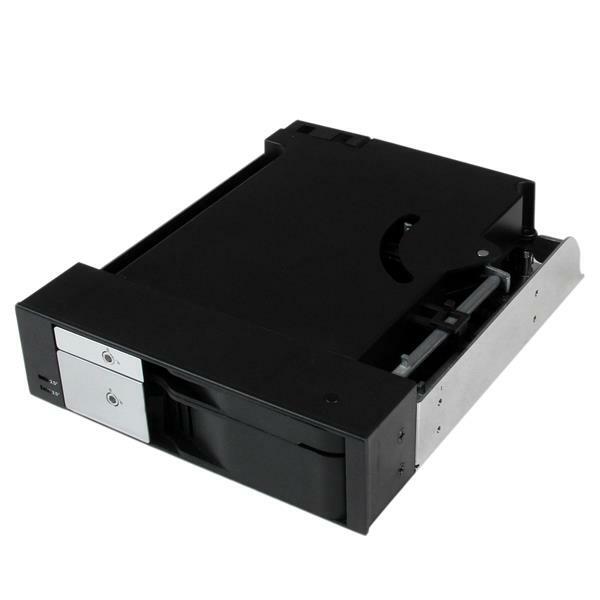 To remove the 2.5" drive, you should only have to pull the upper handle on the unit and open it, then the drive should eject very easily. If you find that you're still having trouble with this, we recommend contacting our Technical Advisors. We're available 24 hours a day, 5 days a week, at 1-800-265-1844 or www.startech.com/chat. I just bought this to fit in a new build to be able to easily swap between all the HDD I have lying around but I think I will be sending it back. Before I put this in, my computer which has 7 140mm case fans, 2 HDDs, a GTX 1080 ti and a huge tower cooler was next to silent. However this product alone (I assume because of the tiny fan at the back) is much noisier than my whole computer. It generates an irritating high-pitched whirring sound continuously, whether there are drives fitted in it or not. The product looks otherwise good (although it doesn't sit quite as flush with the front panel as other 5.25 devices) and seems to be of otherwise good quality but I simply cannot use it as is. Thanks for your feedback and review. We're very sorry the unit is noisy. The fan is needed to move enough air to cool the drives installed in this enclosure. We apologize for the inconvenience. It may not be ideal solution for all situations. If you have two 5.25" bays available, you could consider two of our HSB100SATBK units and one 25SAT35HDD. This combination would involve no fans. We hope this helps. If you have any concerns, please reach out to our Technical Advisors by clicking "Support" at the top of our website. Thank you.